February 2014 in CDS started on a typically conflictual note. Abby Rose complained that she had seen ban lines around the property of Garnet Psaltery in Locus Amoenus, and that walking into the courtyard she was bounced. Garnet replied that she was sorry about Abby getting caught in the crossfire of Garnet’s conflict with Cleopatra Xigalia. But Delia Lake pointed out that the CDS Covenants prohibit ban lines, although they do state that: “as a land owner you are allowed to ban individual avatars from entering your land.” Garnet insisted that she had done nothing wrong, since she had only a few individual ban lines, as could be seen by anyone inspecting the land. This conflict may have contributed to motivating Cadence Theas to propose that the RA designate a sort of “People's Park” where CDS members could put up signs with messages about what is happening in CDS. Permission would be granted to all CDS members to rez signs in that space, on the condition that the messages should avoid naming persons or using incendiary language or graphic images. Every Sunday evening one of the Estate Managers would return all of the signs, so that Monday morning would bring a new start. This idea met with a mixed reception. Cleopatra pointed out that Cadence herself had recently put up such a sign, to publicize her call for a referendum about the Locus Amoenus sim redesign. To call attention to the sign Cadence had rezzed a charred building in flames on public land without permission from anyone (follow Cleopatra's link for a large photo of the sign and the burning building). A week later Pip Torok suggested that everyone observe a truce for Saint Valentine's Day, take down all bans and mutings, and desist from disparaging each other during a 24-hour period. And in a similar cooperative vein, Cadence Theas asked who wants to see flowers early this year? The big issue in CDS during February continued to be the redesign of Locus Amoenus. 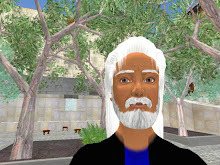 Chancellor Bagheera Kristan looked into how former Chancellor Jamie Palisades had sold land when the LA sim was first opened. It seems he requested notification from people who wanted land, and first gave current citizens priority, then anyone on the list, and finally whatever was left was set for sale on the open market. Bagheera therefore posted a list of the land that would soon become available in Locus Amoenus, and invited those interested to send her a notecard inworld indicating which of the parcels they were interested in. On 11 February Rosie Gray posted the minutes of a CDS Artisan Guild Meeting that had been held that day to discuss the list of buildings requested by the Chancellor for LA. The Guild passed the following motion: “That the CDS Artisan Guild does not endorse the Chancellor's LA redesign as presented, but individual creators will participate on the requested builds, on an individual basis.” However, it seems the transcript of this meeting was never posted to the forum, so it is unclear why this decision was made. Builders interest in building various pieces of the sim were to negotiate directly with the Chancellor. That same day, Bagheera posted the LA building request notecard that she had sent around on 7 February, concerning: 1) Guild negotiations for compensation, and 2) List of items for the Guild to consider working on for Locus Amoenus. The second point is self-explanatory. The first point refers to a discussion Bagheera had with Lilith Ivory, who was standing in for Callipygian as head of the Scientific Council, about the proper way to negotiate compensation to the Guild for work performed on LA. Lilith thought the RA should decide this issue, but with Rosie as Guild Master abstaining from voting. On 13 February Victor Mornington complained that Bagheera had asked him to remove the new bridge he had spent hours building, because several people disliked it. He wrote: “Someone could have told me this was building by democracy, then I wouldn’t have wasted my time." An RA Meeting was held on 15 February 2014 (here are the agenda, transcript and minutes). At first there were too few RA members to make a quorum, so Rosie Gray suggested taking citizen’s concerns. Chancellor Bagheera stated that she had been considering giving up her position as Chancellor mid-term, but had decided to stay, which was applauded. Tor Karlsvalt arrived, making a quorum, and it was decided that Rosie would conduct the meeting in the absence of Leader of RA (LRA) Shep Titian. Discussion of citizen’s concerns continued with Patroklus Murakami criticizing the Chancellor for alienating builders from working on LA (he later used the term “micromanagement”), and declaring that the actual build looks amateurish, with elements that are out of place. Bagheera replied that although the Guild voted not to endorse her work plan, individual Guild members have contacted her to work on the rebuild, and that Sudane Erato was about to begin terraforming. Lam Erin encouraged constructive dialogue, and Lia Venra made a rare appearance to support Vic’s work. Tor had to leave, leaving the meeting again inquorate. Discussion continued anyway on the next item, which was by-elections. Callipygian Christensen as Dean of the Scientific Council stated that she had been away from SL, but promised to post a draft law to the forum. This was followed by the sorting out of the old CDS laws. Cleopatra reported that had posted a draft Request for Proposals (RFP) for the updating of the archives. But since Rose Springvale had volunteered to do this work, and since the RA had voted to accept her offer, the only relevant parts of the RFP were the scope of work, outcomes and monitoring. Cleopatra also pointed out that CDS still had no current archivist to ensure ongoing posting of RA transcripts and newly-passed laws. There followed a brief discussion of Cadence Theas’ idea of a place for citizens to rez posters with complaints, some of those present expressing support and others opposed. Cleopatra posed questions concerning the current land managers, and who grants them authority. It seems that Sudane Erato, as official Estate Owner (a role required by Linden Lab), is the only person who can assign these roles and powers. Cleopatra suggested setting time on the agenda of the next RA meeting to ask Sudane these questions. Patroklus Murakami suggested that everyone should simply read NL 5-6 “Estate Owner Act” on the Code of Law page of the CDS portal. And finally, there was no report about the Grievance Committee since Lam Erin had left the meeting by this time, but Rosie Gray passed along a message from Tor that he was planning citizen meetings on the topic in the next week. The CDS Scientific Council (sort of like a Supreme Court to review laws and legal issues) met on 29 January and 16 February. The transcript of the January meeting was posted too late for me to cover it in my last post, so it is described here. The 29 January meeting (agenda and transcript here) began with a discussion of dates for upcoming elections, the problem being that in the Fall there are too many days between the date of the voter census and the deadline to declare candidacy. This leads to the final list of candidates getting announced after the start of the campaigning period. Callipygian Christensen asked Aria Perrault and Lilith Ivory to decide on a final set of dates following the law, to be approved at the next meeting. The SC then discussed a Revised Procedure for Ordinary Scientific Council Meetings, which Callipygian had posted to the forum, with the aim of both simplifying and clarifying the procedures. The discussion was enlarged to address as well the existing unclear procedures for impeachments. Aliasi Stonebender agreed to help review the legislation and work on a new draft. Other items discussed were the procedure for moderation of flagged forum posts, which raised technical questions to be put to Gwyneth Llewellyn, and the idea of a standardized form (notecard) for petitions to the SC, to help citizens who are unfamiliar with the process. Lilith agreed to write a draft. Another SC meeting was held on 16 February (here are the agenda and transcript). Lilith Ivory submitted the proposed elections dates, which were approved. (Lilith then posted to the forum the official dates for the election of the 21st RA and Chancellor, and for the election of the 22d and 23d RA and Chancellor.) The next item, the new SC procedures presented by Callipygian at the previous meeting, was tabled to allow everyone more time to study the draft. Then followed more discussion of the unclear impeachment procedures, but it was suggested that the SC should hold off on formulating any proposal until the RA voted on the proposed Grievance Committee, which might impact the impeachment process. Bagheera herself gave an update a few days later (cross-posted to the General Discussion board) explaining: 1) that she was turning over the rebuild of Locus Amoenus to the citizens who had offered their assistance to her, and 2) that Vic’s bridge was rezzed back at the harbor entrance for citizens to view and comment on. In parallel, Vic made an offer to residents of LA: since the SL marketplace had no buildings which will sit in the small fishing village plots, he would give his services to returning CDS residents or new residents who would buy one of the fishing village plots. Bagheera posted a copy of her LA building request notecard outlining the work that needed to be done on LA. She also indicated which ships on the SL marketplace would be suitable for Locus Amoenus water parcels. Cleopatra presented the results of her own research on the definition of the Tuscan Theme, which attracted a series of mostly hostile comments. Patroklus, while noting that Bagheera had improved her communication about the LA rebuild, proposed the opening of a sub-forum devoted to the LA rebuild, which would bring together all the information and help resolve issues. The final posts in February were on the recurrent theme of how to handle conflicts. Lam Erin presented the Draft Legislation for a Grievance Committee, which Cadence and himself had prepared. And Cleopatra suggested that everyone should reread the Forum Moderation Guidelines, including the procedures by which the Scientific Council is supposed to protect all citizens from abuse and personal attacks (of which Cleopatra clearly feels herself to be a prominent victim).